Ketaki was lucky enough to be spotted by Film maker Sujay Dahake to play the lead role in his film ‘Shala’. The film was shot during the year 2010-11, when Ketaki was in 11th standard. It was all set to release last year around Ganapti festival time, but couldn’t find a distributor. But when film maker Mahesh Manjrekar saw this film, he was highly impressed with the subject. He also liked the performances of the children. He is now releasing this film under his banner ‘The Great Maratha Entertainment’. The screenplay of this film has been adapted from the best selling novel of the same name , by reputed Marathi novelist Milind Bokil. The novel looks at the passionate love in its purest and elementary form, in school, i.e. the form of the first love. The movie is an attempt to bring the very essence of pure, unrequited love that the character Joshi a 9th standard schoolboy feels for his classmate, Shirodkar. Ketaki plays this character of Shirodkar and looks very confident in that role. Even before its official release the film has already been shown at various festivals like MIFTA at London, where it was premiered, then at the 10th Asian Film festival, Mumbai, the 7th Asian Film Festival, Pune & Kolhapur and at Leicester Square, Prince Charles Theatre. It has also been screened at NCPA’s Marathi Film Festival- Nave Valan and has received a good response. 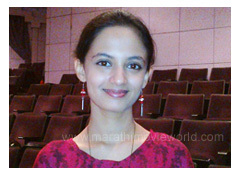 Ketaki was present recently during the press conference of this film at Ravindra Natya Mandir, to announce the date of film’s release, when she spoke to MarathiMovieWorld.com about her experience in film. “I began my career as a singer, but when this acting assignment came to me, I became more serious about acting. We had to undergo a workshop on acting, where myself and other children were explained about our behaviour with each other during shooting. Today, we children talk to each other very freely. But, it was different situation 35 years ago, the actual period shown in this film. Hence we all had to pose ourselves very shy, while interacting with each other. Especially, when I faced the camera in scenes opposite my co star Anshuman Joshi. There were many good things we learned from our Cinematographer Diego Romero and it was a good experience,” said Ketaki. Speaking about managing her shooting schedules besides her studies, Ketaki said that the shootings of this film took place as per our convenience, in few spells and it was like being with our own family. Sujayda, our director was perfect in his work and I learned so many good things from him. I am really thankful to him for selecting me for this role, “ she added. Smart and confident looking Ketaki faced the media with poise. Now, Ketaki is all excited to see how people respond to this film. “Please come and see this film in theatre,” was her appeal.